South Australian elm trees are again under attack from elm leaf beetle. Since late October these small destructive olive green beetles have been flying into the canopy of elm trees where they are now feasting on newly emerging leaves. Elm leaf beetle damage to leaves is easily identified by the shot hole-like holes they leave behind. Having dined for a few weeks, the beetles mate and the females lay double rows of small sesame seed-sized yellow lemon-shaped eggs on the underside of the leaves. These hatch in a few days and the larvae begin feeding on either side of the leaves. Damage caused by the larvae as they grow is particularly damaging as they remove all of the green matter, leaving nothing behind except a skeleton of veins. Left alone, the larvae mature, crawl or drop to the ground to pupate and start another life cycle. Heavy infestations can quickly defoliate a canopy of leaves and cause serious tree decline. Light infestations of elm leaf beetle on a healthy tree can be managed. According to Adelaide arborists, the key is to keep your tree healthy along with early identification of the insects when they first invade. 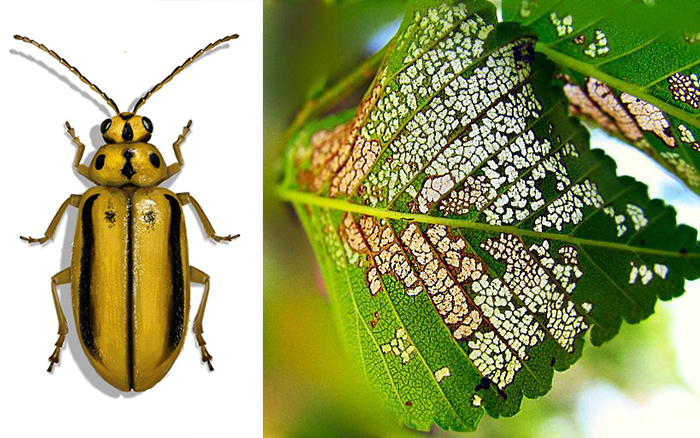 Serious and regular elm leaf beetle attack is a sure indicator that your tree is stressed. Lack of subsoil moisture through summer. Surface sealing i.e. pavers or impermeable materials preventing aeration of roots and natural recycling of nutrients. Trauma such as root damage. A low toxic systemic insecticide containing imidacloprid can be injected into the growing bark of established trees. Because it is systemic it is moved throughout the branches and into the trees leaves, killing the larval stage of the beetle. This must be applied by an arborist. Approximate cost is $250 for a mature tree. 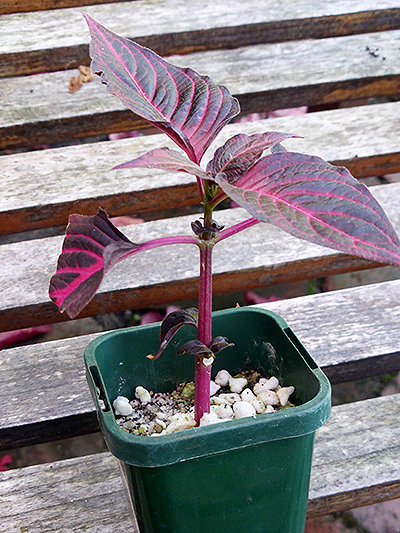 Now is a good time to take soft or semi-hardwood cuttings from indoor plants. Most plants will also benefit from a light trimming and reshaping. The prunings can often be used as cutting material. The size and quality of apricots that will ripen soon after Christmas can be improved significantly by increasing the amount of water the trees receive over the next few weeks. A medium size tree carrying an average sized crop should be receiving 200 litres of water per week. This should be increased to 400 to 500 litres per week towards harvest. However, withdraw all water once the fruits begin to ripen. If you only have space in the garden for one fruit tree – consider growing a fig. 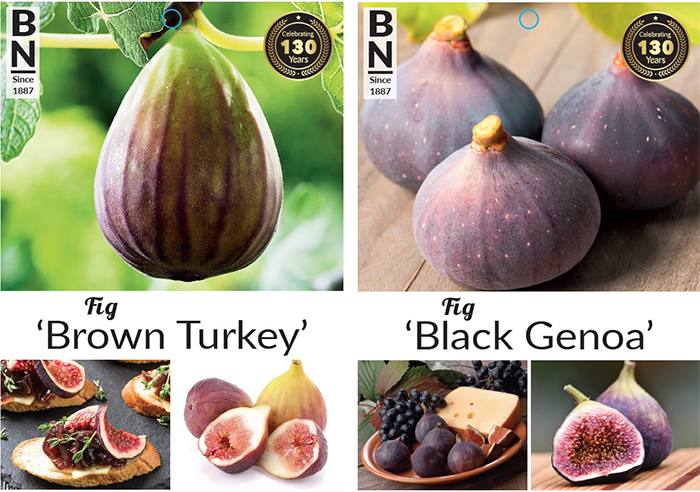 Figs are remarkably easy to grow, produce heavy crops of sweet dark red fleshed fruits on trees that thrive in our warm dry climate. Tree size is easily managed by pruning. Figs can also be trained to grow as a space saving espalier. Black Genoa Masses of large round, rich flavoured fruit through summer and autumn that can be eaten fresh or used in deserts and jams. Vigorous tree. Self fertile. Brown Turkey Medium round fruit with purple/brown skin and rich, sweet, dark red flesh. Excellent eaten fresh or used in deserts and jams. Vigorous tree. Self fertile. Despite this week’s showery weather, don’t be surprised if the potting mix supporting your container plants is quite dry below the surface. This is particularly likely if the containers are located in a sheltered courtyard or the plants are not yet watered regularly. The easiest way to check is to feel the topsoil a few centimetres below the surface. If it is dry – a good soaking this weekend may be needed. Is the root ball really wet? Potting mix that is allowed to dry out has a tendency to become water repellent. Often much of the water you apply runs down the side of the container rather than diffusing through the root ball. 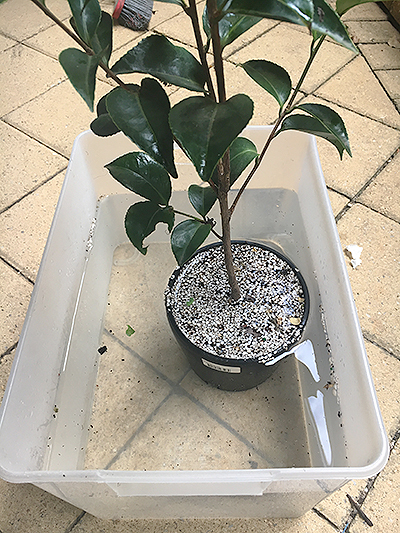 A simple test (for relatively small plants) is to place the container - that has just been watered - into a bucket or bath of water. If the root ball is still dry you will see air bubbles rising to the surface. If you are continually frustrated when the water you apply to hanging baskets and container plants during the hot weather runs over the soil rather than soaking in, treat yourself or at least the plants, to an application of soil wetting liquid or granules. Both work well. In South Australia regular use of soil wetters should be considered just important as plant nutrition. It’s been a great season for garden roses and in many gardens they are still at their blooming best. So how to keepi the Queen of flowers happy through the warmer months? Roses enjoy at least 6 hours of sunlight a day. If you grow them in too much shade there growth will become lanky with few flowers. Apply a good layer of organic mulch like pea straw or lucerne to conserve water and reduce competition from weeds. Annual applications of compost will also improve the health and vigour of your roses. Some roses are particularly susceptible to fungal diseases like Black Spot and powdery mildew, they need space to breathe.Don’t allow them to be swamped by over enthusiastic companion plants, which can block airflow, and increase the likelihood of disease. Apply Seasol throughout the growing season to promote strong healthy root growth and to help keep fungal diseases such as black spot and sucking insects like aphids at bay. Take care of your roses from top to bottom while promoting masses of blooms by applying the new PowerFeed with Troforte Rose Food and Soil Improver. This will promote healthy growth and stimulate bigger, brighter more colourful roses. Once tomatoes and capsicum are well established they can be trained, through weekly deep watering, to produce very high yields. However, while they are becoming established they will need regular light watering, (1 to 2 L every 2 to 3 days, according to plant size) particularly during hot weather. How much water is enough for tomatoes? 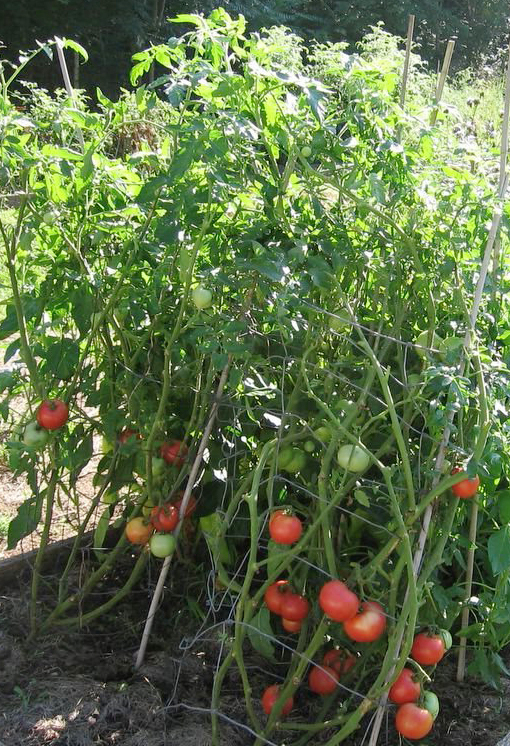 Where tomatoes are concerned small sized (cherry) varieties have the greatest drought tolerance while beefsteak and round fleshy varieties such as Roma have the highest water requirements. Popular varieties with medium sized fruit such as Mighty Red, Apollo and Gross Lisse are in between. 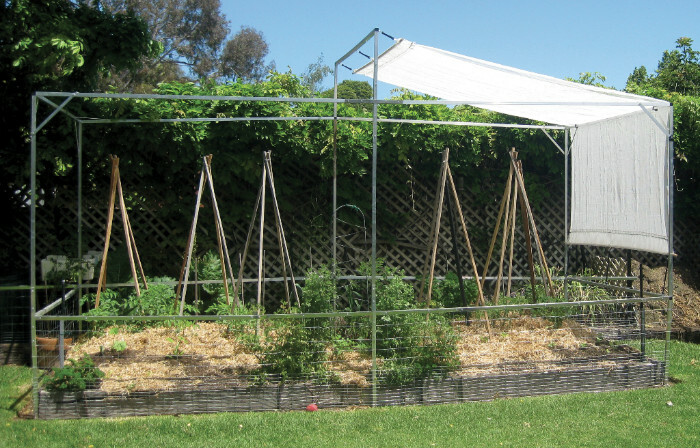 While tomatoes are sun lovers, shading with 50 percent shade cloth in the afternoon once the first fruit has started to ripen can reduce water losses through evaporation by 30-50 percent. In many gardens the preferred lawn grass is now couch or Kikuyu. Both are extremely tolerant of heat and drought, they are extremely hardy and with just a little maintenance add considerably to the look and value of your property. Perhaps the only real downside – they can become spongy. In this week’s lawn blog, turf advisor Stefan Palm explains what causes this sponginess and what you need. Fruit thinning of stone and pome fruits should be carried out soon after the tree has completed its first natural shedding of fruit. This is usually 4 to 6 weeks after fruit set. However, to reduce biannual bearing problems this task needs to be completed by late November, when the trees begin to form next season’s fruit buds. The aim should be to achieve an even spread of fruit over the trees canopy. Be prepared to reduce fruit clusters as well as removing individual fruits. 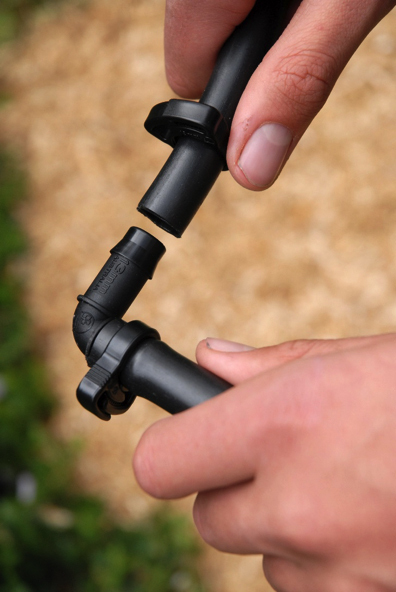 Installing a drip or micro irrigation system must be one of the best ways of reducing water in the garden. These systems are so easy to install and considering their effectiveness but also cost-effective. Simply follow the installation guidelines provided by SA irrigation advisor Alan Ferber and download the installation fact sheet provided by Antelco irrigation. A 175 kPa Pressure Regulator to connect to the tap or timer. A 13mm Filter for protecting the system from contaminants. 13mm Fittings for branches and bends around the garden. Your choice of drippers and sprays to do the job. 13mm poly tubing to lay around the garden. 4mm poly tubing for connecting drippers and sprays to the 13mm tubing. A 2 n 1 Punch n Cut tool for cutting and punching holes in tubing. A pair of pliers or multi grips for securing Ratchet Clamps. Good Gardening is unable to answer individual reader's questions via email. If you're looking for specific gardening advice please give me a call on ABC Radio Adelaide's Saturday morning Talkback Gardening or speak to the experts at your local garden centre. Mount Lofty Botanic Garden. Organised by the Friends of the Botanic Gardens of Adelaide. Lower car park (off Lampert Road, Piccadilly) 10.30 am to 2.30 pm. Last monthly sale for the year. However, the Friends will be selling plants from the Mt Lofty Botanic Garden Nursery in December – Tuesday, December 4 , Friday 7, Tuesday 11 and Friday 14, between 10 am and 2 pm. Purchasers may drive to the Nursery car park. There will be a sign before the Lampert Road gate. A large, rambling country garden divided into several areas by walls, plants or other structures. There is a focus on form, texture and perfume. An historic two acre garden surrounding a gracious old Victorian home dating from the 1880s. The sloping site has been terraced and designed to incorporate different garden styles with areas that have strong Italianate, English or tropical influence. Gardens open 10 am to 4.30 pm. Entry $8 - OGSA members; $6 - Government concession card holders; children under 18 free. ABC Radio Adelaide Talkback Gardening this Saturday – phone me and Spence Denny on 1300 222 891 and have your own gardening question answered. Guest – Stephen Hoepfner, urban market gardener, garden lecturer and vegetable garden advisor. Topic – Taking vegetable growing at home to the next level. Saturday 12 noon - 5 pm, and Sunday 10 am - 4pm, Klemzig Community Hall, 242 North East Road, Klemzig. Admission $2. Enquiries 8251 2299. Friends of the Botanic Gardens of Adelaide guided walks for the public at Adelaide, Mount Lofty and Wittunga Botanic Gardens, and Botanic Park. Open free to the public every day of the year from dawn to dusk, except on fire ban days. Free guided walks on the first Sunday of every month, 11 am to 12.30 pm. Meet at the West lawn (Croquet Lawn) of Urrbrae House. Bookings not necessary. At the end of Walter Young Avenue, off Fullarton Road, Urrbrae, or from the Urrbrae House gate, Claremont Avenue, Netherby. Open from dawn until dusk every day. Free entry. Disclaimer: Although all reasonable care is taken in preparing information contained in this email, neither Jon Lamb Communications (JLC) nor its officers, staff or suppliers involved in the editing and production of this email accept any liability resulting from the interpretation or use of the information set out in this document. 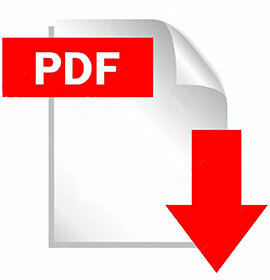 Information contained in this document is subject to change without notice and is of a general nature and should not take the place of professional personal advice. No responsibility is accepted by Jon Lamb Communications for the accuracy of information contained in web sites linked from this email. Publication of an advertisement does not constitute endorsement by JLC of any product or service, or warrant its suitability. Copyright © 2018 Jon Lamb Communications, All rights reserved.